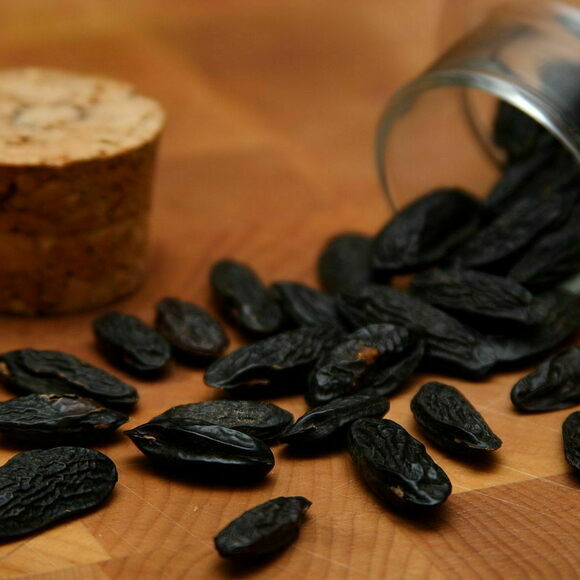 The tonka bean, which gives off notes of vanilla, cherry, and almond, infuses desserts, drinks, and even perfumes around the world. British chefs mix it into cocktail syrups and grate its shavings over pastries, while pâtissiers in France whip up tonka bean–infused ice creams and custards. In fact, the French love the bean so much, they’ve dubbed their obsession fièvre tonka, or “tonka fever” (a play on fève, the French word for “bean”). And yet, if you’re in the United States, stocking these wrinkled, raisin-looking beans in your spice cabinet could get you raided by the Food and Drug Administration. Tonka beans, a product of the South American cumaru tree, contain a naturally occurring chemical known as coumarin. Since coumarin can cause health problems such as liver damage, the FDA has enforced a ban on tonka beans since 1954. However, it would take eating 30 whole tonka beans to experience any negative effects from this toxicity. And no one eats the beans whole. Due to tonka’s potent flavor profile, a sprinkle of its shavings is enough to create a rich and heady aroma. By some reports, a single bean can flavor as many as 80 dishes. The low levels of coumarin, coupled with the fact that the chemical appears in many other legal ingredients (such as lavender and cinnamon), has led many American chefs to ignore the ban. In 2006, the FDA raided Chicago restaurant Alinea after hearing that chef Grant Achatz used the beans. It mustn’t have been too discouraging: Two years later, Achatz’s Alinea cookbook featured a recipe for tonka bean sponge cake. Restaurants around Europe serve up dishes that incorporate tonka beans and tonka bean extract. Even in the United States, where they're illegal, you can still buy the beans from online retailers. Remember: Tonka beans turn deadly in high quantities. Avoid eating them by the fistful. This central London restaurant serves up almond croissants flavored with hazelnut and tonka bean shavings. Though drink specials vary, they've also poured sour cocktails infused with tonka syrup. During Christmastime, the head chef has been known to make mince pies spiced with tonka beans. This Paris spot often serves creme brûlée enhanced by tonka beans. If you’re eager to get up close with the illegal ingredient in the United States, but are still hesitant about ingesting the beans, this bar has been known to mix up a bourbon-based cocktail that comes with a side of "tonka fog" (made with dry ice, hot water, and one bean). The aroma creates the sensory experience without the need for consumption. Just in case the FDA derails their use of tonka, call to make sure they're serving it before visiting (1-312-667-6793). Their dessert menu boasts an arlette that's flavored with chocolate, caramel, and tonka beans.